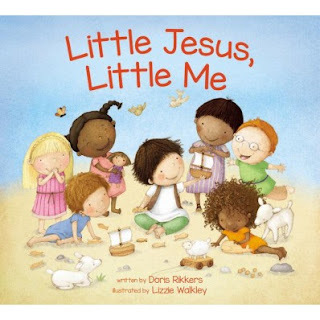 Book Review: "Little Jesus, Little Me"
Thank-you Zondervan with zblog squad for sending me this book for review. I was not paid for this review and all opinions expressed are 100% my own. This very simple board book is sure to excite your little ones. Within in no time, they will be reciting the repetitive line with you and feel good about themselves as a reader! Each page says, "Jesus ____fill in blank_______ .... "just like me!" Each page features a little kid doing something just like Jesus. Is a very sweet book to help kids understand that Jesus was a kid at one time. Some people might throw a fit because our Bible doesn't talk about Jesus doing these activities but I don't want to fuss over it. Jesus was a baby and he did learn to walk and he probably did like rocking in his mom's arms. Now go and read this book with your little one!